(TRICARE) – When military moms or dads go to war their children face unique challenges. This week on “Dot-Mil-Docs”, Maj. (Dr.) Keith M. Lemmon, from the Department of Pediatrics at Madigan Army Medical Center, explains the importance of screening military youth for deployment stress and the many resources available to help children grow up healthy in a military home. Hosted by the Department of Defense, “Dot-Mil-Docs” broadcasts at www.blogtalkradio.com/Dot-Mil-Docs Thursdays at 3 p.m. (EDT). MADIGAN ARMY MEDICAL CENTER release – Madigan Army Medical Center walked away with several awards during the 2008 Military Health System (MHS) Conference, held last month in Washington, D.C. Each award reflects the level of expertise, medical knowledge and capabilities of the military and civilian personnel who keep Madigan moving forward into the 21st Century. As a teaching institute, Madigan Army Medical Center was awarded the Uniformed Services University of the Health Services Excellence in Teaching Award for its commitment to student success in developing clinical skills as an essential component of academic studies. “The medical center’s dedication to the promotion of quality teaching, learning, mentorship, research, and service is a model for all institutions to emulate,” the award certificate reads. Maj. (Dr.) Shad Deering, the director of the Andersen Simulation Center at Madigan and the chairman of the Army’s Central Simulation Committee, was awarded the 2007 DoD Patient Safety Award for Technologic Innovation for a Military Treatment Facility, presented for the development and implementation of the Mobile Obstetric Emergencies Simulator created at Madigan and then built and distributed to eight other Army, Navy, and Air Force hospitals. For the second year in a row the Army Surgeon General presented performance awards to all three medical facilities within the Western Regional Medical Command (Madigan, California & Alaska) for workload improvements, in recognition of workload increases of five percent or greater, from April 2007 through September of 2007, compared to the same six-month baseline period in 2006. Madigan garnered $100,000 for the inpatient workload category as measured in Relative Weighted Products. MADIGAN ARMY MEDICAL CENTER release. – Madigan Army Medical Center’s use of simulation technology has received national recognition. The Charles A. Andersen Simulation Center is the first educational institution in the Department of Defense to be accredited by the American College of Surgeons – and only 21 other health care education facilities in the U.S. have this distinction. This three-year accreditation designates the Andersen Simulation Center as a Comprehensive Level 1 Center of Surgical Education Excellence. The simulation campus for the accreditation also includes the Medical Simulation Training Center at Fort Lewis. The Andersen Simulation Center supports Madigan’s graduate medical education program and the training of hundreds of nurses and medics throughout the Western Region. Since its opening in 2002, more than 17,000 medics, nurses and doctors-in-training from the Army, Air Force, Navy and Coast Guard have used the center to hone their medical skills. The center also has professional agreements with several local colleges and universities, to include the Institute for Surgical and Interventional Simulation at the University of Washington, that extend the training opportunities to medical and nursing students in Washington State. Additionally, the simulation center has received numerous accolades for its recent development and deployment of a Mobile Obstetric Simulator, a device used to practice routine and emergency infant deliveries. The device earned Madigan a DOD Patient Safety Award. AP reports on a missing 62nd Medical soldier - she was to deploy to Iraq soon. Gannett reports that Lt. Col. Joseph A. Munaretto, 38, an Army physician stationed at Fort Lewis died of a heart attack while deer hunting. Tacoma-Pierce Cunty Chamber of Commerce Release – Lt. Col. (Dr. Carl Gibson, Chief, Endocrinology Clinic, Madigan Army Medical Center, 2007 John H. Anderson Military Citizen of the Year Award, presented annually for the last 29 years by the Tacoma-Pierce County Chamber in recognition of outstanding contributions to the community made by service members who call Pierce County home. “Lt. Col. Gibson, as a volunteer, gives to the community through a number of organizations,” said George Cargill, Northwest market vice-president for TriWest HealthCare Alliance, sponsor of the award. Like John H. Anderson, a mayor of Tacoma during the 1950s, Dr. Gibson’s long list of projects demonstrates the special commitment to community improvement that the award is meant to highlight. LTC (Dr) Gibson moved to Tacoma and Fort Lewis in July, 2000. He immediately started serving his community through his local church, St. John Baptist Church, located in the historic Hilltop area. He started the St. John Health Care Ministry planning, organizing and delivering many educational programs to the congregation. He directed the medical ministry to provide free blood pressure and blood glucose (sugar) checks during Sunday services. Under LTC (Dr.) Gibson’s direction, the health ministry collaborated with the Spanish Outreach Ministries from Life Christian Center in 2004. Together, they offered free health screenings to migrant workers and members of the community during an all-Saturday event in the churches’ parking lot. LTC (Dr) Gibson, also volunteers to help with annual community screenings held at events such as the Ethnic Fest (July) and annual Latino Festival in the community. LTC (Dr) Gibson also served his community through service on the leadership council of the local chapter of the American Diabetes Association. He was chair of the Walk for Diabetes Program in 2004. He volunteers to give talks to community groups about diabetes prevention and management. He also volunteers each November as a speaker for the Annual Diabetes-Month Forum. He’s worked with the American Heart Association (AHA) and its outreach programs to the increase awareness of cardiovascular disease (high blood pressure and stroke) in the African American community. He has worked with the AHA Cultural Health Initiatives Subcommittee to help develop an education program for barbers and beauticians in the African American communities of Pierce and King Counties. As a result of these efforts, each participant business now has a device to automatically measure blood pressure. Each business owner has been trained to measure blood pressure and provide appropriate guidance to his or her clientele. This program received recognition by the AHA at a national gala held in Atlanta in May 2007. LTC (Dr) Gibson has also spearheaded efforts to encourage collaboration amongst community healthcare educators. He founded the Health Coalition for Communities of Color, bringing together representatives from groups as diverse as the Korean Women’s Association, the Centro Latino, the Tacoma Pierce County Health Department, the NAACP, the Tacoma Urban League, the African American Fraternities & Sororities, youth groups, and many other civic and faith-based organizations. The Health Coalition’s mission is to advocate for ethnic minorities in the United States and eliminate disparities in healthcare delivery. Through education and knowledge transfer, the organization seeks to empower communities of colors to become active participants in their own care and to make health a top priority. The Coalition advocates equal access and delivery of healthcare to all communities. LTC (Dr) Gibson has been instrumental to the delivery of several annual programs, to include General Health Overview (February), HIV/AIDS in the Youth Community (March), Women & Heart Disease (May), Men and Prostate Disease (September), and Seniors Health Expo (September). A broad range of professionals (doctors, nurses, registered dietitians, and psychologists) have participated. These educational programs are often hands-on experiences (e.g. cooking demonstrations by local chefs), and afford community members access to free health screenings such as mammograms, cholesterol measurement, blood pressure checks, diabetes screening, and prostate specific antigen measurement. For each of the past two years, LTC (Dr) Gibson has taken time to be a speaker at the annual African American Legislative Day held in Olympia. He also volunteered to speak on “Race & Pedagogy” at a national conference held last year at University of Puget Sound. LTC (Dr) Gibson has served on the board of Nativity House, Tacoma’s only day homeless shelter. He still finds time to return to Nativity House and help serve meals during the holiday period. In 2004, LTC (Dr) Gibson was asked to testify before the Washington State Select Committee on Health Disparities. At the request of State Senator Rosa Franklin, he testified about the impact of education on the quality of life for the citizens of Pierce County. There is no question that LTC (Dr) Gibson devotes countless hours and boundless energy to improving healthcare through education. He’s exploited non-traditional settings, working to help save the lives of those in this community. I strongly encourage you to select LTC (Dr) Gibson for this prestigious award. John H. Anderson served as Tacoma’s mayor in the early to mid 1950s. He is also a past Chair of the Tacoma-Pierce County Chamber Board of Directors, as well as a successful local businessman. Tacoma-Pierce County Chamber (www.tacomachamber.org) was founded in 1883. Its mission is to promote a strong business climate fostering economic opportunity and a more livable community through advocacy, networking, resources, and services for business development. 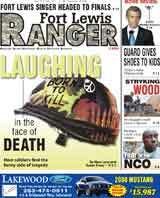 (Ranger Staff) – Three Fort Lewis medical units are headed to the warzone. The 551st Medical Logistics Company (Logistics), the 153rd Medical Detachment (Blood), and the 673rd Medical Company (Dental Services) will hold a deployment ceremony Friday, 10 a.m. at Sheridan Gym. All three units are part of the 62nd Medical Brigade, whose headquarters is currently deployed. It is the 551st third time overseas – it deployed to Iraq from April to July 2003, and then from December 2004 to December 2005 the unit spent the year in Qatar, providing medical logistical support to 14 countries. This deployment, the 551st heads back to Iraq. The 153rd, which activated in September 2006, deploys to Iraq for the first time. The unit will collect, store and distribute blood and blood products. The 673rd deploys for a second time to Iraq. Former shoe maker at Madigan now cobbling on other side of the mountains. Click here for the Ellensburgh Daily Record story. What did you do over summer vacation? FORT LEWIS, Wash. -- Six Madigan Army Medical Center nurses spent the summer tag-teaming medical care for hundreds of kids at the YMCA’s summer resident camp at Camp Seymour, located on the scenic Glen Cove between Gig Harbor and Allyn, Wash.
First Lt. Melanie Budnik, a clinical staff nurse on 6 South, was excited as she began her stint at camp July 31. Her week began by getting to know the routine. Budnik, who arrived during the Sunday check-in and finished her duties there the following Saturday, spent most of her days being available in the event a kid is injured or becomes ill. But the real work – barring any emergencies – is the handing out of medications. The association between Madigan and Camp Seymour began in 2005 when Madigan nurse Kim Idland, then working as a nurse in Tacoma, answered an ad in the paper for a nurse to work at summer camp. Fast forward to Madigan, present day, where Idland is a registered nurse and talking with her boss about her support of the camps. They thought it would be great if more nurses could get involved. By word of mouth news of the opportunity spread, but time off in the summer is a premium. Until one nurse got an idea. Wasn’t there a way to request Permissive Temporary Duty for active-duty Soldiers to engage in volunteer work? That idea panned out. Also volunteering this summer were Kim Idland and Capt. Cheri Lay, 1st Lt. Kelley Watts, 2nd Lt. Caroline Glover, and 2nd Lt. Nathan Rave, who are also nurses at Madigan. Camp officials say they couldn’t be happier with Madigan’s participation, and added that they hope we’ll come back. The presence of nurses at Camp Seymour and other camps also gives young people an opportunity to establish a relationship with someone in whose footsteps they might follow, Sandstrom suggested, so there’s a recruiting piece as well. Second Lt. Nathan Rave got more out of the duty than he had bargained for. FORT LEWIS, Wash. -- Last month, Madigan Army Medical Center was named, for the third time, one of the top 100 “Most Wired” hospitals in the country. The results of the 2007 Most Wired Survey and Benchmarking Study were released in the July issue of Hospitals & Health Networks magazine. For a while now, it’s been known throughout the country that Madigan is at the forefront of information technology in the health care field. The 2007 Most Wired award was presented to Madigan officials during a July 23 ceremony held in San Diego, Calif.
Salzman attributes this recognition to the continued support of Madigan’s leadership. “There’s an ongoing commitment by the leadership to be at the forefront of information technology, and more importantly, clinical information exchange,” Salzman said. This accomplishment also highlights Madigan’s ongoing commitment to excellence. “The award is further proof that Madigan continues to push forward with building future information technology capabilities to mature the organization as a model for the Army Medical Department and the Military Health Service,” Salzman added. The Most Wired Survey is conducted annually by Hospitals & Health Networks magazine, which uses the results to name the 100 Most Wired hospitals and health systems. It focuses on how the nation’s hospitals use information technologies for quality, customer service, public health and safety, business processes and workforce issues. The American Hospital Association’s CEO, Rich Umbdenstock, said that many hospitals have made strong commitments to using information technology to improve the quality of care. “They are combining technology with clinical knowledge and creativity with a focus on improving outcomes, making care safer and more streamlined for both patients and clinicians,” Umbdenstock said. Madigan also made the top 100 Most Wired list in 2004 and 2006. To read more about this year’s top 100 Most Wired hospitals, visit http://www.hhnmag.com.